The start of the new year brings a flood of W-2 and 1099 forms to your mailbox, which means it’s time to start thinking about the dreaded process of filing your taxes. On Tuesday, TurboTax announced its latest iOS tax apps to help you meet—or better yet, beat—the April deadline. The company’s mobile offerings allow you estimate your tax refund, file your taxes, and track the status of your returns. The latest version of SnapTax for iPhone hasn’t changed much since it was first announced at CES 2010. Made for people filing the simpler 1040EZ form, SnapTax lets you take a photo of your W-2, transfer all of the information into the app’s tax return form, and quickly e-file. 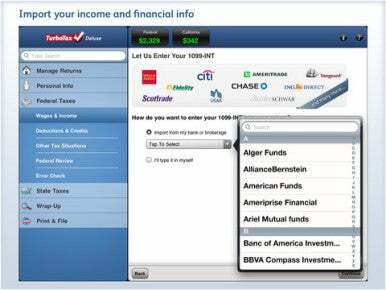 TurboTax for iPad is better suited for individuals and families filing more complex tax returns. The latest version of the iPad app features a few new updates, including the ability to transfer information from your prior year’s returns and import income data from 400,000 employers and banks. 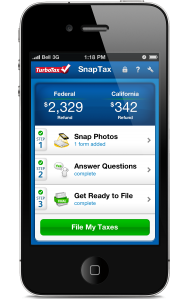 TurboTax for iPad users also receive one-on-one tax advice from TurboTax’s experts—a feature available to SnapTax as well. Both filing apps are available for free in the App Store, though the company does charge users to file federal and state tax forms. You can file the 1040EZ form with SnapTax for $20; federal tax return filing starts at $30 with TurboTax for iPad, while state tax returns cost an additional $37. If you want to know where your tax refund stands prior to filing your taxes, you can use TurboTax’s TaxCaster, now also available on the iPad. The app uses the same tax calculator found in TurboTax’s desktop software—enter in basic information and the app will give you an estimate of your refund or what you owe. Once you’re done filing, MyTaxRefund helps you keep track of your tax returns. Users can see the status of their federal and state returns that have been filed electronically. The app indicates whether returns are pending, accepted, or rejected, helping users figure out when to expect that refund. For those who choose to receive their tax refund in the form of a TurboTax Prepaid Visa Card, the company has released TurboTax Card Mobile specifically to track the balance and transactions used with the card. You can also track your federal tax refund, activate your card, and locate ATMs with the app. All of TurboTax’s apps are available for free on the App Store. TurboTax for iPad requires an iPad running iOS 4.3 or later. SnapTax and TaxCaster require an iOS device running iOS 4.1 or later; TurboTax Card Mobile requires iOS 4.0 or later; and MyTaxRefund requires iOS 3.2 or later.